My sister gave this one two thumbs up, and when I heard that the novel may be adapted to film, I decided to give it a try. I've been on the waiting list at the library for ages, and was finally able to pick it up this week. It looks like a dark read, but interesting. Husband is the prime suspect in the disappearance of his wife. Or is he? I'm actually almost finished with this one, but thought I'd add it to the list anyways. T let me borrow it on my new Kindle, and because he rarely reads and mentioned liking it, I wanted to check it out. Not the best written fiction I've ever read, but a gripping plot. It made me think a lot about how many things we take for granted (easy access to food, electricity, medical supplies, clean water, etc). I don't know how the story will play out, but it's been exciting to follow the main character as he tries to protect his family after electricity disappears everywhere. Thing is, I am probably one of the few people who doesn't really like Sparks' writing. The stories all seem to follow the same formula. But the premise for Safe Haven looks a little different, and the "preview" pages I read on Kindle intrigued me enough to want to keep reading. I love supporting fellow bloggers when I can, and Marian's new book looks like a delight to read. I love the tagline: "Letting God Breathe New Life into Your Heart and Your Home." 52 projects to make life simpler? Yes, please! This one's a hold out from my Fall Reading List, but I still really want to thumb through this one. Combining history and fashion sounds like something I won't be able to put down! Combined with the bin of magazines I need to flip through, I'd say I have my work cut out for me in the next month or so. I'm a fast reader, but it's difficult when you have to steal the minutes to read! What about you? 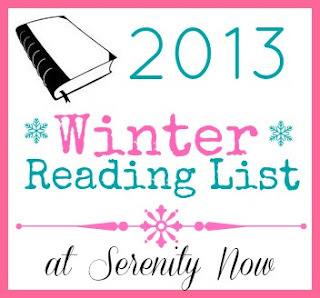 Anything good on your to-read list for this Winter? I want to know how One Bite at a Time goes! Several in my book club have read Gone Girl and loved it!! We are reading Great House by Nicole Krauss currently and I am enjoying it. Great list! I think I need to check out One Bite at a Time. Thanks for the suggestions! I read Safe Haven and enjoyed it. However, it is very different from Sparks' other books. I've been wanting to read "Gone Girl," too and I also can't stand Nicholas Sparks :) "One Bite at a Time" looks great! Thanks for the recommendation! gone girl is a really interesting read, as are her other books. my favorites this year were the night circus and the age of miracles. i have a whole list for the library of things to read, can't wait. enjoy! I just read Katie Couric's collected advice book on The Best Advice I Ever Got - lots of inspiration inside! Gone Girl was my favorite read in 2012! I just got done scheduling my best/worst books of the year and it definitely was my fave! Lights Out sounds interesting! I have been reading the Shopaholic series lately. I think I have one or two left. I want to read the Mindy Kaling book too...she cracks me up! Just finished Gone Girl...in 3 days. Could not put it down! Downloaded 2 more of her books to read on my trip to Paris this month! Gone Girl is definitely a book I want to read in 2013. I'm hoping a friend will buy it and lone it to me. Inspired You and One Bite at a Time both look good. Enjoy your books! Your book choices sound great! I, too, find that Nicholas Sparks's books are all pretty much the same. Nice beach reads, I suppose, because they're so simple, and they're always sweet. My tastes in fiction are a little strange. Much of classic and popular fiction just doesn't interest me that much. But if I find an author I like, I'll devour everything he or she has written. Most of what I read these days, though, is non-fiction. One of the reasons I've not been online much lately is because I've actually read some books! Hallelujah! The best? UNBROKEN by Laura Hillenbrand. It's wonderful. More of a guy's book, I guess, but I just loved it. Thanks for sharing your list!! I went through and added a few of these to my to read list! One of my goals this year is to try and make more time for reading. I just don't read anymore and I really miss it! I definitely need to read the one about simplifying! That is my big resolution for this year - simplify! I hope you had a fabulous Christmas and New Year's!